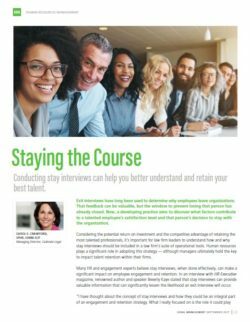 The focus of the article is to build a case for stay interviews as a way to proactively gather feedback on why your best talent stays. Alternatively, exit interviews serve as a reactive measure that only provide insight to inform the future, not the present. “Exit interviews have long been used to determine why employees leave organizations. That feedback can be valuable, but the window to prevent losing that person has already closed. Now, a developing practice aims to discover what factors contribute to a talented employee’s satisfaction level and that person’s decision to stay with the organization.